Sometimes you go to watch a particular band for the first time in a while and immediately end up kicking yourself for not having seen them more often. Step forward Lux Lisbon, one of the classiest and most compelling live acts in the UK, who take to the stage in Newcastle as part of a brief but brilliant November tour and play an intoxicating set of songs new and old to a lively Friday night crowd. Fronted by Durham’s Stuart Rook (vocals, keys, guitar and songwriting) and the wonderful Charlie Austen (vocals, bass, keys and anything else she can turn her hand to), Lux Lisbon are a ‘DIY band’ in the sense that they have no manager, agent, label etc. and are renowned for being the only such act ever to sell out London Scala in advance. The aforementioned Charlie Austen opens the evening with a well-received acoustic solo set, beginning with what she describes as “a lament about Brexit” and closing with the gorgeous Copenhagen and some thought-provoking honesty in Slave To Chemistry. Local lads White Houses (formerly Columbia) are up next with an immensely melodic and energetic collection of songs, most notably the brilliantly catchy Slow Dancing and chiming epic Panic Disorder which leaves a lasting impression long after they exit the stage. And so to Lux Lisbon, who set the tone for the rest of the evening by opening with the eerily brooding Demons You Show and the delicious boy-girl harmonies of We Don’t Believe In Love No More, Charlie’s soulful voice sounding even more splendid than in her support slot when combined effortlessly with Stu’s. 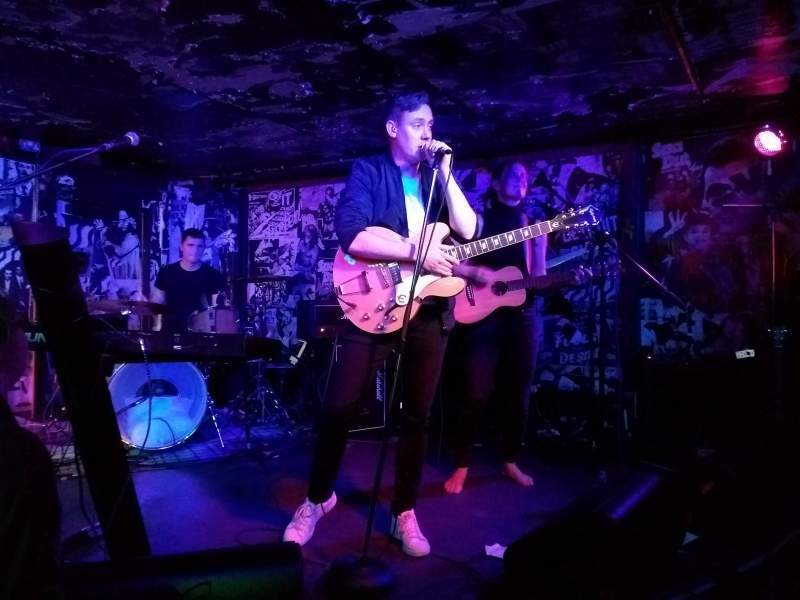 The band’s magic lies not only in their vocal strengths and fusing of funky indie rock guitar lines with pulsating dance beats, but in their impressive array of differing song styles and the continual presence of intelligent and emotive words which trip off the tongue like poetry. New songs Pavlov’s Dogs, Change (To Stay the Same) and My Body Sings Electric are as immediately impactful as those from their earlier releases and will surely soon become as well-loved as the old favourites which round off tonight’s show – the always exquisite Get Some Scars and the superbly biting political commentary of Bullingdon Club. Lux Lisbon are a glorious reminder that while listening to music via CDs and Spotify is all well and good, there’s nothing like the experience of a roof-raising live performance to put a glow in your heart and raise the hairs on the back of your neck.